FAQs | Tri-Country Electric Co-Op Inc. Some security deposits can be waived. If you provide a letter of credit from your previous electric provider stating your past 12 consecutive months of service had no more than two late payments and you were never disconnected for nonpayment of service, we will waive the security deposit. Find everything you need to know to set up Residential service here. A deposit can be refunded after 12 months of billing history with no more than two late payments. After this requirement is met, a member can expect to see their deposit credited to their electric account within three months. If a member disconnects service within the 12 month period, the deposit is credited toward the final bill. My bill has a PCRF charge each month. What is this? Power Cost Recovery Factor is the amount of money charged to generate electricity from our power supplier, Brazos Electric Cooperative, that was not included in our rate base structure. PCRF can change from month to month, based on the cost of the fuel used to generate electricity. The money collected for PCRF is on a penny for penny basis, which means we only collect the amount needed to recover the increase in power costs. What is a membership fee and what are the advantages and responsibilities of being a member-owner of Tri-County Electric Cooperative? When you apply and accept service you become a member-owner of Tri-County Electric Cooperative. Each member contributes a $25.00 membership fee, which is fully-refundable when a member leaves the system. As a member-owner, you have the right to vote and Annual Meeting and District Meeting, as well as elect members to the Board of Directors. Tri-County Electric Cooperative's bylaws fully explain your rights and responsibilities as a member-owner. Do you have an average payment plan? For members wanting the convenience of consistent monthly budgeting, the average payment plan may be for you. This payment plan is designed to help smooth the seasonal swings in your electric bill. To qualify for the average payment, a member needs 12 months of kWh usage and no more than two late payments. To sign up or for more information, please call 817.444.3201. How is an electric cooperative different from an investor-owned electric company? Electric cooperatives and investor-owned utilities distribute electricity to end-users. The main difference between the two entities is in the business model. Electric cooperatives are not-for-profit organizations while investor-owned utilities are owned by stockholders who may not be consumers of the provider. Cooperatives are set up to provide services at cost to member-owners. Money made in excess of expenses is returned to the members in the form of patronage capital, or capital credits. Can I schedule a payment? Yes, a member can schedule a payment through their online member portal or TCEC Connect. A payment must be scheduled on or before the due date. Can I choose my bill due date? On our current meter system, members cannot choose their bill due date. We have over 110,000 meters set up on cycles based on location within the service territory. Our employees read meters electronically using hand-held devices by driving routes throughout the service territory. What and when is the Annual Meeting? What about the District Meetings? Information on Tri-County Electric Cooperative's Annual Meeting can be found here. Learn more about District Meeting here. Why is Tri-County Electric Cooperative my only choice in providers? The Public Utility Commission of Texas sets certification boundaries for all electric providers in Texas. Certifications are either single-certified to a single utility provider or dual-certified/triple-certified to multiple providers. If you live in area that is dual-certified or triple-certified, your developer chose to work with Tri-County Electric Cooperative. How many days does it take to connect or disconnect service? For existing service, Tri-County Electric Cooperative can connect service during the next business day after all account initiation requirements are met. For same-day connection, an additional $50.00 fee will apply. If you are leaving the system and need to disconnect service, we can disconnect during the next business day. How do I update my auto draft information? Your updated draft information will appear under Accounts. For assistance or more information, please call 817.444.3201. How do I remove my stored banking or card information? This will remove any stored credit cards on your account. To update your mailing address, please call our Member Services department at 817.444.3201. Does you offer any assistance programs to help pay my bill in time of need? Tri-County Electric Cooperative provides a list of organizations that may provide members with payment assistance. Does a member need to be onsite for connect/disconnect? A member does not have to be on location to connect or disconnect power. Why would I get a notice telling me to expect a power outage on a certain date and time? Tri-County Electric Cooperative's system requires maintenance to provide reliable service. We will occasionally need to interrupt power to homes and business to safely perform system maintenance. We do our best to inform all affected members before the interruption. We appreciate your patience and understanding when we do have a planned outage. Why do my lights sometimes blink? The majority of temporary power interruptions are caused by equipment installed on our power lines to detect faults and correct the condition before an outage can occur. Many of these temporary faults are caused by trees or animals, like squirrels, birds and snakes. 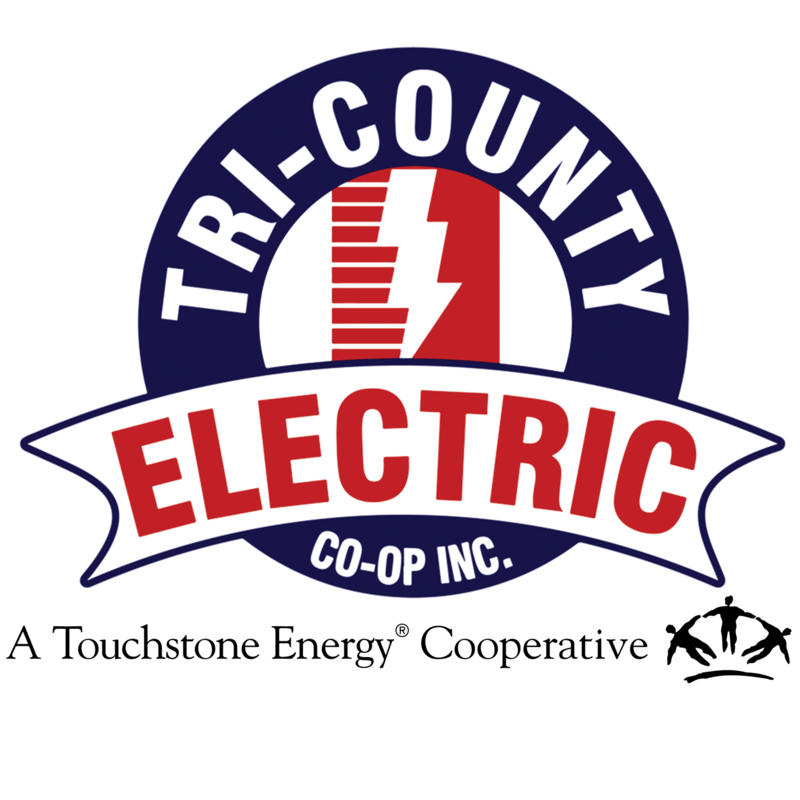 Tri-County Electric Cooperative strives to provide reliable service to all our member-owners. If you experience any momentary interruptions on a regular basis, please contact us so we can investigate your concerns.